Our mini-series on garden renovation continues with working with both even and uneven topography. Most gardeners in urban areas have a flat garden area, in which the elevation does not vary significantly. The advantages of a flat garden are primarily matters of ease of use: climbing is not needed and rolling equipment moves without extraordinary effort. The disadvantages of a flat garden, on the other hand, are both aesthetic and horticultural. Changes of level invite creative landscaping concepts, with opportunities to lead the viewer’s eye to focal points, to conceal and reveal garden vignettes, or to shape a walking path through the garden. Changes of level also invite different plant varieties. A small rise in elevation can improve drainage dramatically and warm the soil faster, thereby support healthy growth of many plants. The preferred approach to create elevation changes in a flat garden is to install a Mediterranean mound, which provides a growing environment well suited for California natives and other plants from Mediterranean climates. This is simply a mound of soil about eighteen inches high and as wide and long as would fit in your landscape plan. Here’s an example from the website, www.the-organic-gardener.com/. Establishing a Mediterranean mound in your garden provides opportunities for size and placement, with the overall design in mind. The usual goal is to simulate a natural setting. The garden renovator could create a Mediterranean mound by moving soil from high spots, or by creating a low spot (which could be fine site for a bog garden). Other situations will require trucking in topsoil from a landscape supply center. Such a bold approach could yield long-term rewards. For information on creating and planting Mediterranean Mounds visit the website of Sierra Azul Nursery www.sierraazul.com/mounds.html. You also can see several mounds in the nursery’s demonstration garden in Watsonville. More extensive approaches to creating elevation changes for a flat garden could require earth-moving equipment, a city permit (especially if your property is in an archeologically sensitive zone) and civil engineering to ensure drainage. 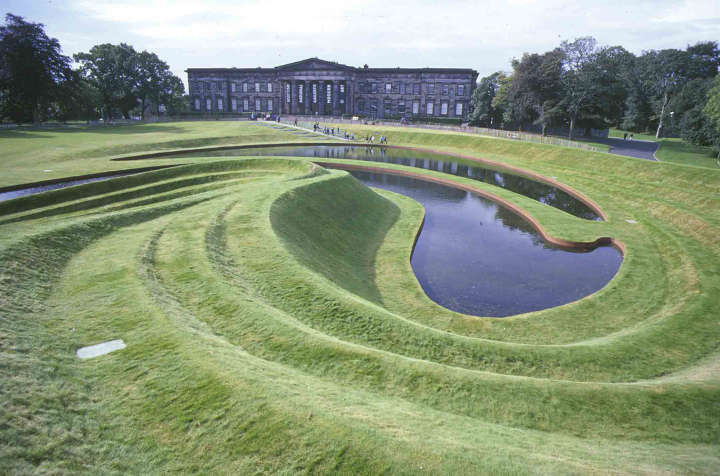 Here is an example of ambitious “land-sculpting” on an estate in England. Consider both benefits and costs. This entry was posted in Spring Quarter and tagged landscaping, Mounds, Renovation by tomkarwin. Bookmark the permalink.